Event Master Pro will respond to your website enquiries in less than a minute with a customized quote based on Event Type and Location. The events industry is highly competitive so it is imperative that you attend to your enquiries as quick as possible. With an automatic quoting system you can relax knowing that people who enquire with you online will be attended to automatically, without you lifting a finger. You can create as many Event Types as you wish and group all your occasions into one of the Event Types. The second variable for providing a customized quote is the location. The pricing is setup to offer different pricing in different cities (not suburbs). So if you are in London and you also service Cambridge, or in Australia you are in Melbourne but you also service Geelong. Then you can have different prices for each of the Event Types. 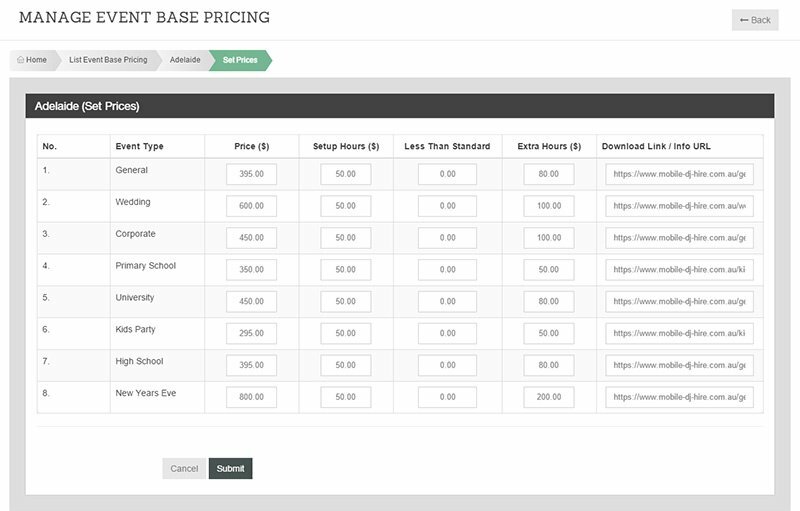 And you will set the prices for each Event Type and City, you can even set different hourly rates for each. Any Extra – Add On Services can also be set in your pricing structure which will be added to the quote calculated on the enquiry form. Additionally for each of these combinations you can have a different download link / URL to offer your online PDF brochure or link to your website with the service outline. Once you have setup your Event Types and Occasions, and the cities you service, then you can embed the enquiry form into your website. 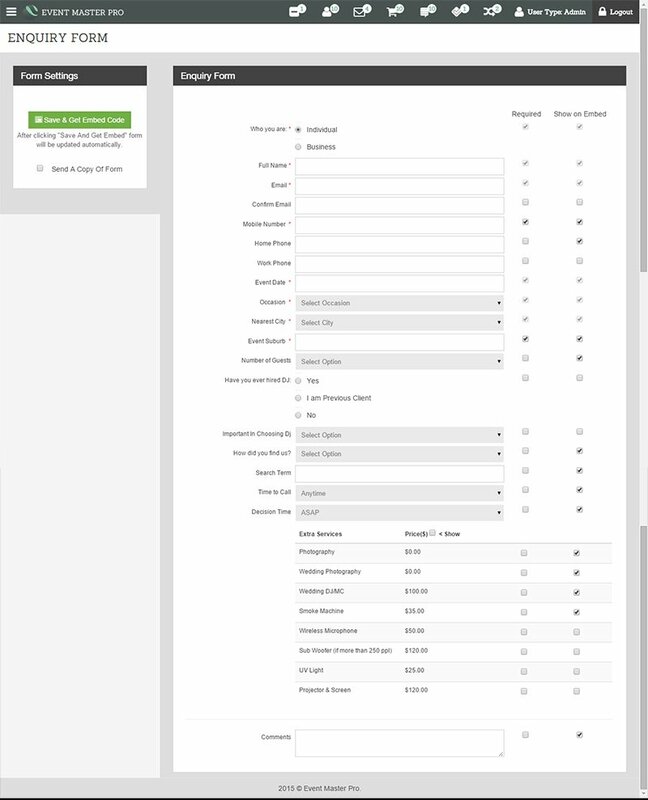 First you will adjust the settings on the enquiry form according to your requirements. You can choose for each field if it will be shown or hidden, required or not. Some fields however such as the date are always required. 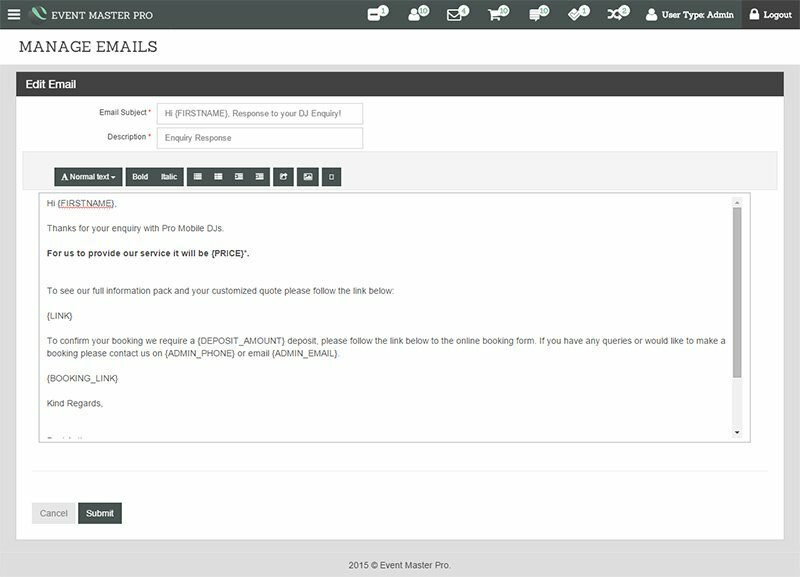 As with all other emails sent by Event Master Pro, the automated email response is also customizable. There is only one email response you can customize but it will provide the customer the customer with the correct price and download link as selected in the ‘Set Prices’ section.